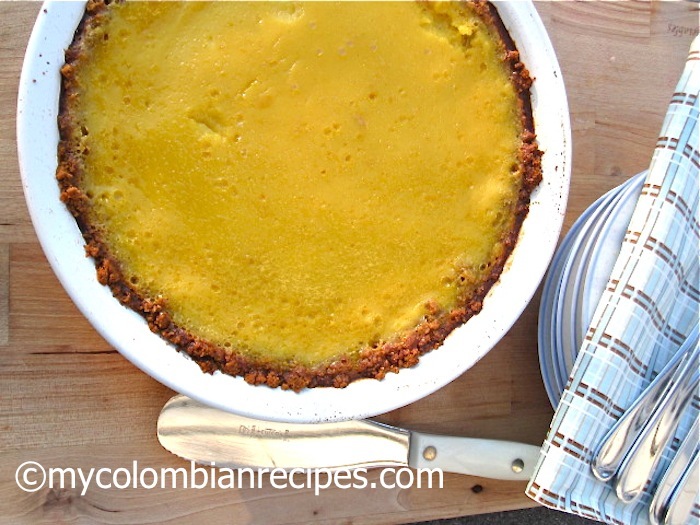 Pastel de Mango is a traditional dessert from the Atlantic coast of Colombia. Mango is a very popular fruit in Colombia and we eat them fresh, often right from the trees! We use them to make traditional Colombian food like mango juice, mango sauce, salads and desserts, such as mango flan, mango popsicles (paletas), cakes, and jams, amongst others. In the backyard of my paternal grandmother’s house were about four mango trees. I wasn’t as close to her as I was to my mom’s mother, Mamita, but one of the things I enjoyed doing when I visited her was picking mangoes off the trees with a long wooden pole and eating them sprinkled with lime juice and salt. If you have never eat en green mangoes that way, you have to try it asap! 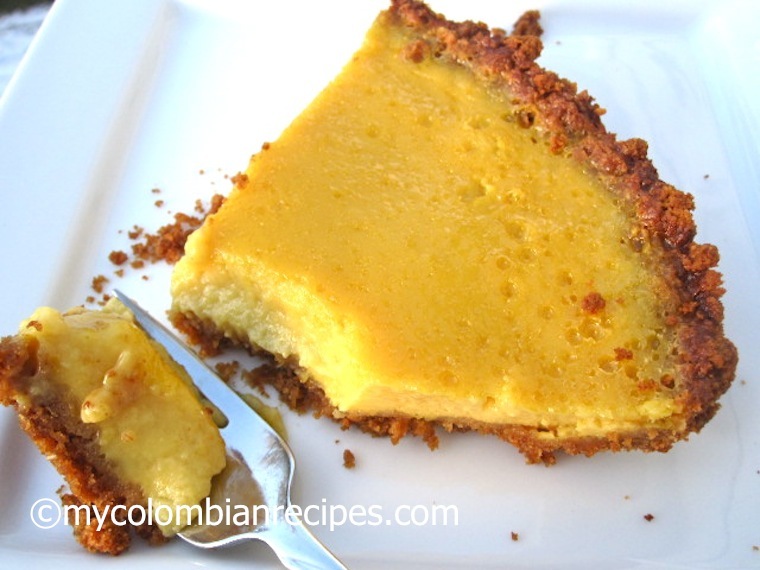 It is a delicious treat and it is a Colombian street food staple. 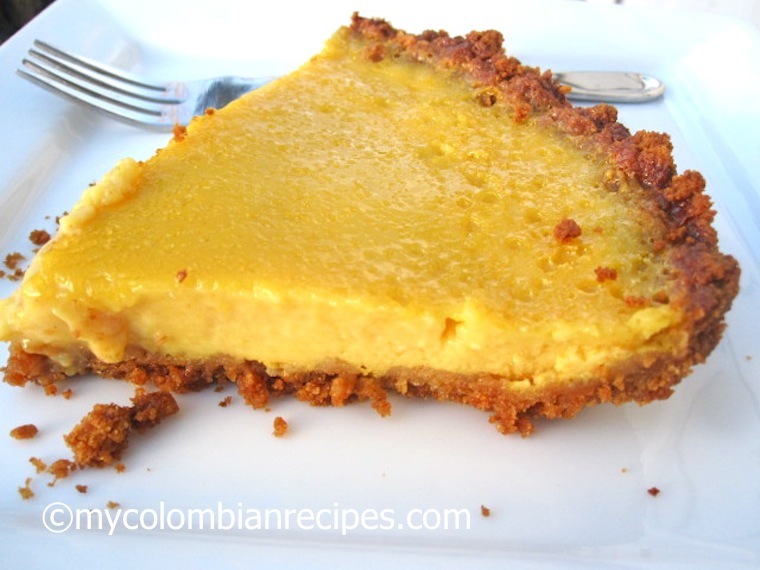 This Mango Pie is traditionally made with pie crust, but I prefer making mine with graham cracker crust. 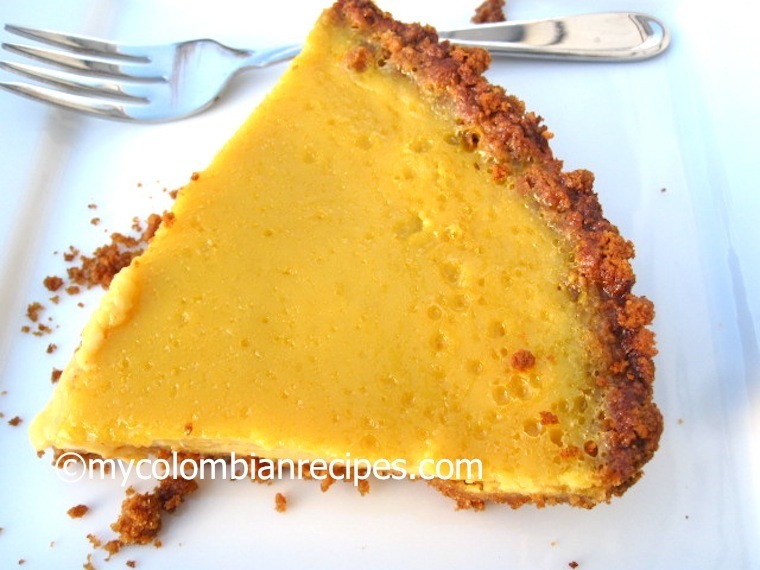 Feel free to use your favorite pie crust for this recipe, and you can use the frozen pulp for the filling if you don’t find fresh ripe mangoes. To make the crust: Preheat oven to 350°F. Place crackers and sugar in a food processor until the graham crackers are finely ground. Add butter and process until well combined. Press the mixture into a 9-inch pie pan. Bake crust until deep golden brown, about 10 minutes and set aside. o make the filling: Using an electric mixer combine the sugar and the mango pulp in a bowl and mix until the sugar is dissolved. Add the eggs and continue mixing for 2 minutes. Add the condensed milk and keep mixing for about one minute more. re-heat oven to 350F. Pour the mango filling into the pre-baked crust. Bake for about 20 minutes. Remove from oven and let it cool down. Don’t have to bake it or use eggs for this recipes.. ingredients I used to make mango pie is graham cracker crust -2, mango pulp- 30 oz, gelatin-3 small packets (4 in one packet), whipped cream – 1 tub, cream cheese -1 bar, sugar if needed, 2 cups water.. dissolve gelatin in 2 cups boiling water then blend all other ingredients and put it in pie crust and cool in refrigerator for 6 hours.. pie will be ready.. I adore mango!! It’s hard to stop eating them once you start…and this pie is just the perfect way to serve them! I made this pie, and after baking for 20+ minutes it is still very soupy. Should I leave it in until it is no longer soupy, or will if come together as it cools? Bake until the filling has set. Let it Cool , then refrigerate for 15 to 20 minutes before serving. We cooked our pie until it didn’t jiggle when shaken. Not all ovens are the same, so just cook it until it doesn’t jiggle. So, at what point do I use the heavy cream??? I would like to know that as well. It doesn’t say in the recipe. 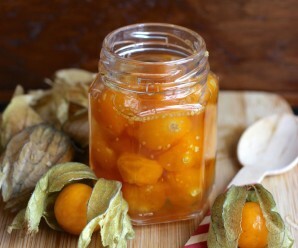 I would love to make this recipe for Easter. In the recipe directions you don’t mention what to do with the 3 tablespoons of heavy cream. Do you add then with the 1/2 cup sweet condensed milk? I did this pie and it is delicious!!!!! and it is very easy to make. Love the recipe. I made fresh thick mango juice from very ripe fresh mangoes, but you can use frozen pulp. What if i dont use the heavy cream is it still posible? Hi!!!! This looks great! It’s only 3/4 of a cup of mangos for 1 pie? I have like 10 in my kitchen. It’s mango season! 😀 how many pies do you think I could make? Does the pie need to be refrigerated after cooling? how do you make the mango pulp from fresh mangoes? I have three mango trees on my new property and a bounty of fresh mangoes. Do you cut up and put in a blender or mash with a fork? Place the mango in the food processor or blender. 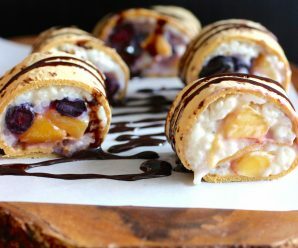 I’ve made this recipe several times now and it’s always a hit, great sweet flavor, easy to make and a sure winner with the family. Thanks for sharing. hello miss erica, im very interested with you’re recipe and i want to make this as a business but how long thus this mango pie last? and after refrigeration , im going to put this in the packaging for the distribution but is it ok not to refrigerate? I’m only concerned with the mangoes being fibrous. Shouldn’t the mango pulp be seived first, BEFORE mixing it with any other ingredients? The pie looks very thin. Could I double the recipe and put it in a taller pie plate? Used a regular pie crust and everything cooked up well, but it took more like 50 minutes for the pie to “set-up”. I did add the heavy cream. It really did not have much mango flavor. How long will this cake last if I keep it frozen?